Here are the VA SOLs for old Christopher Columbus. 1.3 The student will discuss the lives of people associated with Presidents’ Day, Columbus Day, and the events of Independence Day (Fourth of July). §113.5. Social Studies, Grade 3. (C) describe how individuals such as Christopher Columbus and Meriwether Lewis and William Clark have contributed to the expansion of existing communities or to the creation of new communities. describe the origins and significance of national celebrations such as Memorial Day, Labor Day, and Columbus Day. 1 Note to those sobbing for me giving Senor Groom a hard time. We’re friends. He can take a joke. It’s all ok. Or maybe not; either way I’m still doing it. 2 Note this is through 12th grade and Texas has a number of people who are angry Columbus isn’t celebrated more. I am still feeling my way around using Google Earth in the classroom. I want to make it more than a 3d worksheet. I think the key is making the students responsible for creating the files but I think in order to do that they need examples and exposure the program and how to use it on a more basic level. That is what this file is supposed to provide. 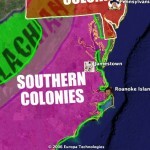 This KMZ file covers SOLs USI 5 (for you non-Virginians that’s the early colonies in North America and some of their climate/economy/settlement rationales/religion). Download the file here. In the end I’d like to see students using it as an interactive hyper-linked notebook. If the teacher gave them a KMZ file at the start of the year and it was divided into folders based on SOLs then that’d get the organization started and the students could be responsible for adding the place marks, additional information and links out to relevant websites. I would like an internal search feature that scanned the info window text (which should be easy for Google) and I think it’d be a complete package for certain content. The mission is “Truth” through omission. Can you get at the underlying truth of a historical document through blackout poetry? Blackout poetry has been fairly popular for a whileIt appears Austin Kleon invented the idea in 2010 which seems crazy. but I haven’t seen any done on historical documents with the intent to get at a deeper, if fairly melodramatic, “truth”. I decided to use The Gulf of Tonkin Resolution. It makes for a pretty interesting way to interact with a dry document and requires a pretty close, and repeated, reading. 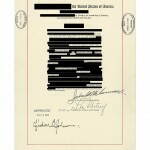 I like the idea of redaction being a way to expose, rather than hide, things the government would rather not have said. The text from above . . . The United States of America in violation of the principles of the of the Charter of the United Nations and of international law, have deliberately and repeatedly attacked the Communist regime in North Vietnam the United States has territorial, military, political ambitions in that area desires the Congress approves the United States regards the Constitution its obligations reasonable assured except that it may be terminated earlier by concurring resolution of the Congress. Geni.com is neat. A great option for dealing with complicated family relationships in history or novels (Richard III for instance). 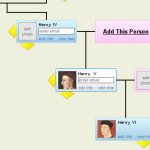 Have your students plot out the family tree and upload pictures all for free in a very easy ajaxy environment. You can move around and zoom in and out to get the big picture. It allows multiple authors so it’s great for group projects and it also has a list view which might be better for some learners. It’s also searchable and you can easily add pictures. The negatives seem to be that you need to have an email address to use it and to invite others in as well. I can’t figure out a way to share a link with non-invited users as of yet either. All in all really cool and I heard about it on Net@Night. I am no longer your friend, and impugning Christopher Columbus is heresy in my book! general directives a whole bunch of ideas—much of which should reset with the teacher in an ideal world. Take Cabeza de Vaca, one of the most amazing exploration narratives that brings into question Columbus’ accomplishments, that would mean a comparative analysis of these figures. I think what we both truly agree on is that the school system has been so routinized, dumbed down, and hollowed out that the people who are trying to anything of worth are ultimately choked out, and the rest couldn’t conjure an original thought if their life depended out in. The brain drain from K-12 is no surprise, it is part of the intentional disinvestment of public education more generally, and that is the real crime and genocide. Can we be friends again now? You had me at Cabeza de Vaca. That’s the thing about standards, they are often pretty decent IF you extrapolate out but that happens very rarely. If you look at the questions driven by these standards you’ll see, in the end, they are not about expanding. Besides this is all elementary stuff, they’ll say that Columbus poem, say some stuff they remember about the flat earth and call it a day. This massacre of our education system will be reported someday, unless we lose completely. If that happens then they’ll celebrate Standardized Test Day. We no longer celebrate Columbus Day? I guess I need to be more observant. I didn’t notice. I remember doing a diary from the viewpoint of Vasco da Gama in 8th grade. I researched Gama, and I discovered he had ordered hundreds of passengers locked into the hold of a ship, which he ordered to be set on fire with the passengers inside. I don’t think I ever looked at explorers the same way. Trying to get inside that guy’s head and figure out why he’d do something like that was hard. I do remember Mrs. Hoy liked my diary. I think people celebrate Columbus day. I see it on calendars. 🙂 Jim would be protesting in the street if it wasn’t celebrated. Didn’t know that about da Gama. That would have gotten my attention as a student. You must have had an interesting teacher. She was good. I remember the assignment was that we were either given or chose an explorer to do this project about, and we had to research the explorer’s life. I remember that I liked my guy’s name, but I didn’t know anything about him before I began my research project. All of this is to say perhaps the French can get off ok here, but the English and especially the Spanish have a hard time coming out of this looking like heroes in this round of coverage. Yeah, I see what you’re saying but I disagree based on the way I see these topics covered. It’s one thing to say the Spanish practiced slavery, it’s another to say they threw babies into fires, worked at genocide etc. etc. Slavery is minimized in the mind of students, in part, because it was something we Americans did and therefore can’t be too bad. Now if you compared the genocide to Germany’s actions during WWII you’d have a very different conversation and likely a different reaction from students. The way I read the Spanish section is the Spanish come out ahead in the minds of most students. They conquered and brought Christianity (positives). Students aren’t going to blame them for diseases (and to some degree shouldn’t). Besides you’ve really got to be blatant in a different way to overcome all that’s come before. I don’t see the English getting anything negative at all unless the teacher takes it there directly. I don’t know. Standards certainly have limits and it’s up to the teacher but the way I see stuff covered in VA tends way towards the surface with little deep thought or nuance. I think it’s easy for people in higher ed to believe that the thought in their sphere is much more universal than it is.